At the Vale Centre in Port Colborne, Ontario on October 13th, the (4-1) Niagara Whalers hosted the (1-8) London Lakers in Greater Metro Hockey League action. The Whalers were coming off a 8 – 1 win on October 6th over the St George Ravens in GMHL action. 1:18 into the opening period, Kellan Rosenbaum and Brandon Lindberg set up Jakob Reeves for the Whalers first of the game. John Swiatek sinks Niagara’s second of the contest 4:06 into the period with Nick Pastorious and David Christopher adding the contributors on Swiatek’s goal. Daniel Pugliese brings the hosts lead to 3 – 0 at 9:21 of the period with Reeves and Lindberg earning their second helpers. 59 seconds past the halfway mark of the period, Eisai Arai fires a pass to Laker Quinton Henry to pull London within two. Pastorious sinks the Whalers fourth at 11:40 of the first with David Christopher and Swiatek registering the contributors. Reeves finds the back of the visitors net at 12:41 of the first with Patrick Desjardin and Lindberg adding the assists. At 4:38 of the middle stanza, Mason Shumate sends a pass to Whaler Frolov Mikhail to increase the lead to 6 – 1 for Niagara. With the host shorthanded at 5:33 of the period, Pastorious finds the back of the net with Jesse Masterson adding the helper. 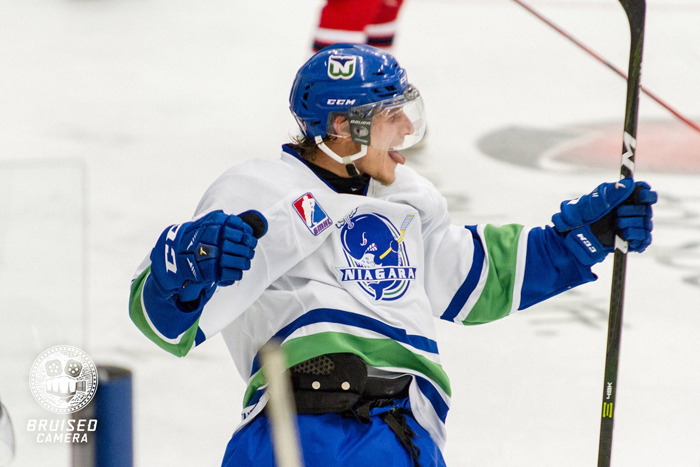 Scoring his second of the period at 15:08 and giving the Whalers an 8 – 1 lead was Whaler Frolov Mikhail. Mitchell Chastelet and Swiatek drew the contributors on Mikhail’s goal. Masterson draws the helper on Niagara’s ninth of the game 59 seconds into the third on Swiatek’s goal. Brandon Lindberg notches the Whalers tenth of the game at 5:47 of the period with Pastorious and Pugliese earning the assists. Austin Brunet finds the back of the Whalers net six seconds after Niagara’s last goal with Parker Gee setting up London’s second of the game at the 5:53 mark of the period. Sinking their second shorthanded marker of the period was Whaler Sam Martin at 10:06 of the third. Reeves and Desjardins registering the contributors. Swiatek and Lindberg set up Niagara’s twelfth of the contest at 11:24 of the period with Masterson’s goal to bring the lead to 12 – 2. Eisai Arai sunk the third for the Lakers at fourteen minutes even with Hunter Lanetz and Chris Spicer adding the contributors on Arai’s goal. Sinking his second of the game at 14:34 of the final period was Laker Brunet with Jorell Crisostomo and Eric Chalrebois notching the helpers. Niagara goaltenders Luke Hill and Austin Dero shared the duties between the pipes with Hill turning away 7 of 10 shots while Dero stopped 13 of 14 shots in the Whalers 12 – 4 win over London. At the other end of the ice, Owen Stevenson and Scott Galbraith were in net for London with Stevenson making 10 of 15 saves along with Galbriath allowing seven goals for the visitors. The Whalers will now head to Kingsville, Ontario on October 15th for a 3:00 p.m afternoon matinee to meet the Kings in GMHL action. The Lakers will now return to London to meet the Windsor Aces on October 14th for a 8:00 p.m puck drop.